Sometimes social theory can seem dry and intimidating – as if it is something completely apart from everyday life. But in this incisive new text, Brian Heaphy show exactly how the arguments of the great contemporary theorists play out against extended examples from real life. 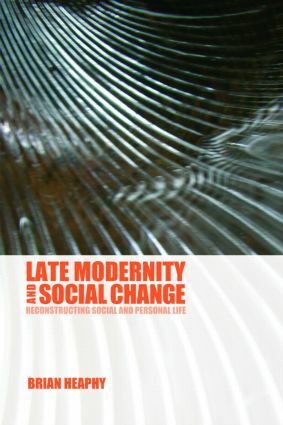 Introducing the ideas of founding social thinkers including Marx, Durkheim, Weber, Simmel and Freud, and the work of key contemporary theorists, among them Lacan, Foucault, Lyotrad, Baudrillard, Bauman, Giddens and Beck, the book begins by examining the merits of the 'late modernity' thesis against those of the proponents of 'post-modernity'. The authors show the wide swoop of influence of 'post-modern' thought and how it has changed the way even its opponents think. It also discusses feminist, queer and post-colonial ideas about studying modern and post-modern experience. With examples from personal life (including self and identity, relational and intimate life, death, dying and life-politics) to bring theory to life, this clear and concise new text on contemporary social theory and social change is ideal for students of sociology, cultural studies and social theory. 1. Introduction 2. Founding Narratives of Modernity and the Logics of Social Change 3. The Deconstructive Turn 4. Postmodernity and the Cultural Turn 5. Late Modernity and the Reflexive Turn 6. Reconstructing Self and Identity 7. Reflexive Relating and Intimacy 8. Death, Deskilling and Life-Politics 9. The Sociology of Reflexivity or Reflexive Sociology? Brian Heaphy is Lecturer in Sociology at Manchester University. His sociological interests include theories of social and cultural change and changing patterns of personal life.